I was 14 when I first saw famous chef Martin Yan pulverize garlic and ginger with his big Chinese cleaver on Yan Can Cook, his television show from the 1990s. My eyes grew wider as he then moved on to effortlessly slice his way through vegetables and meat, with the food seemingly offering no resistance to his cleaver. I, a kid who had just started cooking a year earlier, yelled at the screen, “I want one of those!" So I chose knives to start a column on kitchen equipment essentials instead of something like groovy kitchen gadgets. You can’t be that guy, the kitchen god that others revere, unless you know the fundamentals of making good food. A big part of that involves prep work, and, a big part of that is, indeed, cutting stuff up. Much of the frustration regular people experience with cooking is because of the time and effort involved in getting raw material ready. A dull, blunt knife will make this excruciating, while the right kind will make it a breeze, resulting in a happier you, and you can’t cook good food without feeling the love. Unhappy cooks make for unhappy diners. 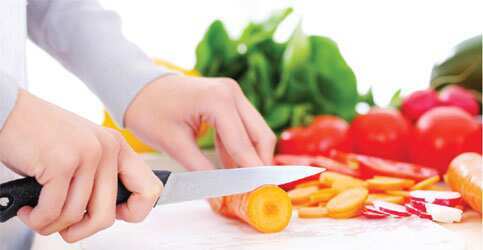 Combine sharp knives with decent knife skills and that kilo of vegetables will not take you half an hour to cut. You’ll be done in 5-10 minutes instead, leaving you with time to enjoy a drink. But first, I shall digress for a couple of minutes to talk about that workhorse of the Indian kitchen—the typical six-inch knife with a cheap plastic handle. Their edges are rarely sharp enough for heavy-duty chopping, their shapes make it virtually impossible to use professional knife techniques with them. If you continue using them, you’ll never acquire the speed and skill a chef has. There are only three kinds of knives you need to have to do 90% of everything. And if you can’t get all three, just get the first one. Brands to buy: Unfortunately, Indian makes (the ones sold in retail channels anyway) are universally terrible. Your best options are to buy a Victorinox (check their website for store locations) or to get a friend visiting from the US to get you a Wüsthof or J.A. Henckels (heavier German knives) or Global or Shun (lighter Japanese ones). A paring knife is a small knife that has a straighter 3-4-inch blade and a sharp tip. It comes in handy for tasks when the big daddy is too big. For instance, coring an apple, deseeding capsicum, or peeling fruits and vegetables. Brands to buy: Fortunately, you don’t need expensive knives for this type. Just a sharp one will do. There isn’t a specific brand I recommend, but test its sharpness before you buy. This will come handy in cutting bread (obvious, eh?) because it’s designed to work with food that is texturally different outside and inside (like bread—crusty outside; soft inside) and won’t crush the food instead of cutting it. It can also be used for cutting tomatoes without sending tomato juice flying all over your kitchen. Brands to buy: An affordable Brazilian brand called Tramontina can now be found in stores, and does the job satisfactorily. 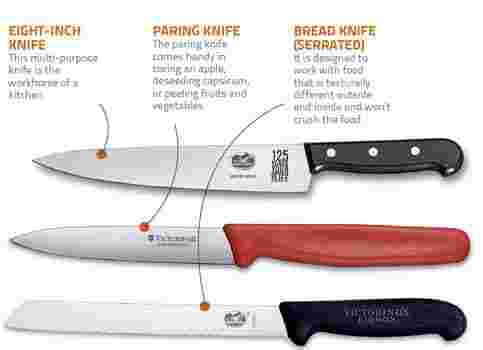 Of course, if you have the dough, spring for an imported knife—the same brands I recommended for the chef knife. Remember, the sharper the knife, the less likely you will cut yourself. Sounds counter-intuitive? It’s because dull blades are more likely to slip and slide to the side when you cut food, increasing the chances of chopping bits of your fingers off. A sharp knife, on the other hand, will slide right through smoothly. That’s pretty much all you need to kick off happy cooking adventures. A primer on knife skills, the other part of being a knife guru, is beyond the scope of this column. I advise you to watch YouTube videos of someone like Jamie Oliver showing you how it’s done. 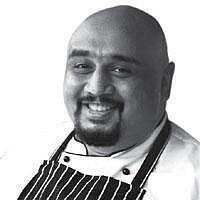 Madhu Menon is chef, restaurant consultant and food writer.